I wanted to talk to you about something very important and that is your portfolio. There are two main things I want you to focus on when you are preparing your online portfolio. 1. Show your best work. 2. Show the work you want to attract. This can be tricky when you are first starting out or trying to make a shift. For example, if you want to attract clients who appreciate emotive lifestyle images YOU CAN'T post images that aren't in this fashion. If you have a portfolio full of images of everyone perfectly posed and all looking at the camera then that is what you are going to attract. Okay let me go deeper. I strongly believe that you should push your portfolio to it's limits. For example, if you check out mine, there are no photos of everyone looking at the camera. Do I take shots like that at every single session? You bet. But I never show those images on my portfolio or online. Why? Because I want to be absolutely sure that the clients I am attracting are connected to my true artistic style. As I mentioned above, you have to only show your best work. I see so many photographers with super out of date portfolios full of images that are not their best work. 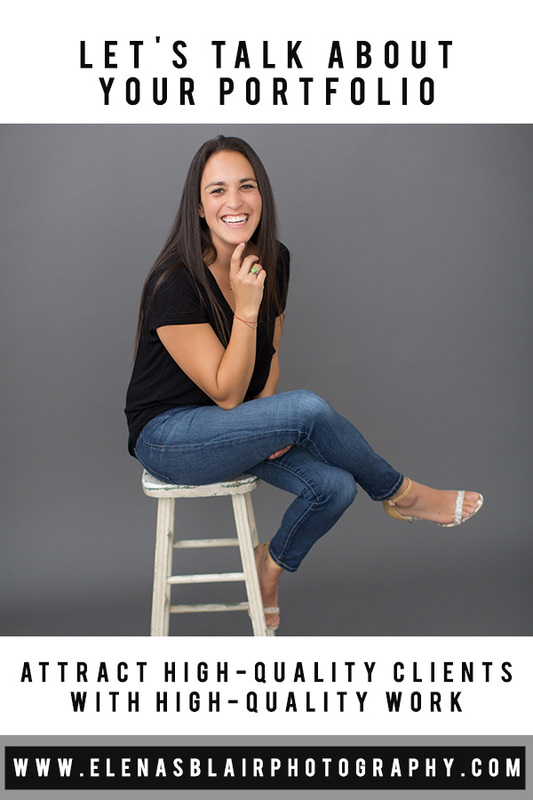 How can you expect to attract high quality clients if you aren't showing high quality work? Now I get it. When you are learning your work will change and grow rapidly. So this means that your portfolio needs to reflect that. Go in regularly and remove your subpar work and replace it with your better work. Your portfolio is where you show off your talents and skills AND where you share your unique style. Okay, friend. So ask yourself this. 1. Am I showing my best work? & 2. Am I showing what I want to attract?